Don't worry guys, Dark Souls II is going to hate you as much if not more than its predecessor. With the recent deluge of information on the upcoming Dark Souls II fans have been clamoring for an answer to one very important question: Will the game be as difficult as Dark Souls and Demon's Souls? 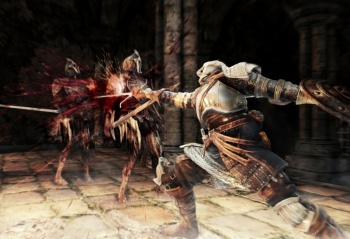 Most modern games are inarguably easy affairs, but the Souls series has attracted a rabid cult following by directly bucking this trend and offering players a title in which success can only be achieved by those willing to put in a ton of effort and actively improve their own abilities. Sometimes luck also plays a part, but more often than not that ethereal concept, like everything else in the Souls games, seemingly wants you to die in the most horrific fashion possible. Cutting to the heart of the matter, Siliconera recently asked Dark Souls II director Yui Tanimura about the game's difficulty, and his response should come as good news to fans. "I personally like difficult games myself, so if I had the opportunity to make a bold difference, it would have been to make the game even more difficult," Tanimura states. "But obviously this is a sequel to a series, so I have no intentions of turning the tables 180 degrees. So no, there is no intent by myself to make [Dark Souls II] easier at all." "I plan to add onto the perfection that was Dark Souls and try to carry on the core essence," he adds. "Which is the satisfaction of overcoming these incredibly tough challenges, but to also enjoy the deaths, to enjoy the hard times. That's something I want to maintain." There you have it: Dark Souls II will improve on its predecessor and offer the same kind of frustrating difficulty that becomes ever-so rewarding once you finally eviscerate that gigantic boss creature who'd spent the last week murdering your dumb human face over and over and over again.